The TTC replaced the service changes for October with the ones that are coming up on November 23 before I had a chance to copy them so I am wondering what they were? Was it the following: 28A ending on October 12, end of construction on 80, accessible service on 69 and last day of Wonderland service on 165A Nov 1? IIRC, 116A/E is now every 15min after the Oct change; could be the Sept one, don't remember. 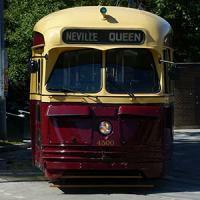 Seasonal service ends - The seasonal Saturday daytime service on the 28A (Davisville Stn-Brick Works) route will end. The last day of service this year will be Saturday, October 11, 2008. City road construction ends - The temporary schedules in use during the City of Toronto construction on The Queensway will end. There will be minor changes to service levels, and specific trip times will change. New accessible service - New accessible service will be operated on this route, using low-floor buses. Seasonal service ends - The seasonal service to Canada's Wonderland on the 165A WESTON RD NORTH (York Mills Stn-Wonderland) route will end. There will be no change to service levels south of Major Mackenzie Drive, although some specific trip times will change. The last day of service to Canada’s Wonderland will be Saturday, November 1, 2008. I'd like to be able to see that page the old TTC site had with the cumulative service changes from the 1990's onward. It hasn't seemed to have migrated onto the new website along with a couple other features. I know this thread is a year old, but it's that time of year again. Thankfully, whoever started this thread didn't add the year, so technically it's valid. Steve Munro's blog has been able to dig up the service changes the TTC plans on making in OCTOBER. He already managed to get the September service changes before the TTC even posted them (back in July, here's the link). Which isn't that big of a feat considering when they're done. Anyway, here's the rundown of what's planned for October 18, to see all the details check out Steve's website. Construction at Bathurst and Fort York Blvd. will have the 511 BATHURST and 310 BATHURST NIGHT rerouting along King, Spadina and Queens Quay. A new premium express route (probably to make up for the loss the the current ones come September) will begin. 145 DOWNTOWN/HUMBER BAY EXPRESS will run rush hours between downtown and Marine Parade Dr. to serve the Humber Bay condos with selected trips continuing/originating from Kipling. This has been a perennial attempt by Councillor Grimes who kept getting shot down by the TTC due to the perceived lack of sufficient ridership. Let's see how it all pans out. Perhaps there is enough critical mass in the area to sustain the service. The 501 QUEEN and 301 QUEEN NIGHT will be split. The western half will run from Long Branch through to Parliament-Dundas-Broadview, while the eastern half will run from Neville Park to Shaw-King-Dufferin. With the 301 split, the two halves will have timed transfer in the downtown overlap section. A new 41E KEELE EXPRESS branch will be created running between Keele Stn. and York U only via Keele, Weston, Rogers and Keele instead of Old Weston Rd. The 60E STEELES WEST EXPRESS-HWY. 27 and 60F STEELES WEST EXPRESS-YORK U will be merged with service running only as far as Kipling. The 28A DAVISVILLE-BRICK WORKS service ends October 17. The 165A WESTON RD. NORTH-CANADA'S WONDERLAND service ends November 1. Service to Toronto Zoo will be reduced to reflect the shorter operating hours. I did not see these three coming. The 41E is especially a shocker as I can't remember ever reading about any proposed express routes on Keele before. I wonder what the stops would be between the University and Keele Station. York U students like me will love those. The emphasis with the improved 35E should be on reliability rather than increased frequency. For example, an improvement of only two minutes (from 17 to 15) but with 3-4 more buses to improve reliability will be heavily noticed by riders. Annette, St Clair, Keele, Eglinton, Gulliver, Lawrence, Wilson, Sheppard, and local till York U? My guess would be St. Clair, Rogers/Weston, Eglinton, Ingram, Lawrence, Falstaff, Wilson, and Sheppard. This is based on the 35E though. I disagree with Annette. That stop is rarely used and the 89 serves it southbound anyway. I could see most of these being stops as well as Keele & Finch. The only ones I don't think would be are Rogers/Weston (replace it with Rogers & Keele), Ingram and Fallstaff. I agree, it is only used by 2-3 passengers most of the time when I ride 41 or 89. Reliability isn't the issue - the buses have lots of layover time at both ends (and especially at the top). The issue is traffic congestion along the route. 35E drivers have zero time at either end in the heart of peak period. Any layover time they are taking just puts their bus further behind. Really? So they shouldn't be sitting at the Commons for 7-10 minutes every day? Usually not, since they arrive at the same time as the departure, and then leave 5-10 minutes late. I can't blame them though, especially when it's a 1 hour 45 minute round trip. If you gotta go, you gotta go. They have 12 minutes of scheduled recovery time in the mornings - and about half of that is at the top end. Qsy8070 is talking about practical experience with the line, you are talking about what it's scheduled to be. It seems that if there are supposed to be 6 minutes layover at the north end (as you say) and the buses are arriving at their departure time (as Qsy says), that tells me that the buses are regularly 6 minutes behind schedule. More running time would probably be a benefit. But they're not leaving late. They leave on time from the top end all the time. If they regularly arrived late at the bottom, than most drivers would leave a couple of minutes early to allow themselves some recovery time at the bottom. Since they don't, one can assume that the amount of time that they have is fine. I usually don't stick my neck out in these kinds of conversations, but I've stood for two years at the top of 35E waiting for buses that in the heart of rush hour always leave late. I don't think I've ever left on the 4:19 or 4:36 run on time. The 4:02 is the last run that leaves on time because it comes from the yard, after that the route is incredibly unpredictable. Putting 1 or 2 more runs on and keeping the same frequency in PM Rush would significantly improve the delays. The same question was posed at Steve Munro's site. 41E Keele northbound: Stops at Keele Station, Keele & St Clair [at existing 41 KEELE nearside stop], Weston & Rogers, Keele & Rogers, Donald, Eglinton, Ingram, Lawrence, Falstaff, Wilson, Sheppard, Finch, Murray Ross & York U Busway, and York Lanes. 41E Keele southbound: Stops at York Lanes, York U Busway & Murray Ross, Finch, Sheppard, Wilson, Falstaff, Lawrence, Gulliver, Eglinton, Donald, Keele & Rogers, Weston & Avon, Keele & St Clair (farside), and Keele Station. 60E Steeles eastbound: Stops at Kipling Loop, Islington, Weston, Signet, Peter Kaiser, Jane, Keele, Dufferin (farside), Hidden Trail, New Westminster, Bathurst (farside), Village Gate, Hilda, Tangreen, Yonge & Steeles, and Finch Station only. 60E Steeles westbound: Stops at Finch Station, Steeles & Yonge (farside), 100 Steeles Ave, Hilda, Village Gate, Bathurst, Carpenter, New Westminster, Conley, Dufferin, Keele, Jane, Adesso, Signet, Weston, Islington, and Kipling Loop only. Buses will make all stops on Lake Shore, Marine Parade, Fleet, Adelaide, Jarvis and Richmond. Also, an update on the premium express routes — the premium fare will remain on the routes through to June 2010. This is beautiful. I'm heading to york and i live not far from keele street. Unbelievable that 60E doesn't stop at Founders Road for York U students. I'm already predicting a Facebook petition will come out of that. As for 41E, not surprised at all about any of the stops, except perhaps Donald. As for 41E, not surprised at all about any of the stops, except perhaps Donald. Donald is probably for George Harvey students since the stop in right in front of the high school. I think the TTC is putting alt of faith into the York U busway being the main route between the university and the subway. The removal of the 60F branch could be a means of forcing people onto the 196. Local options still remain otherwise it's a trudge up to Keele and Steeles or a transfer to catch the new 60E.